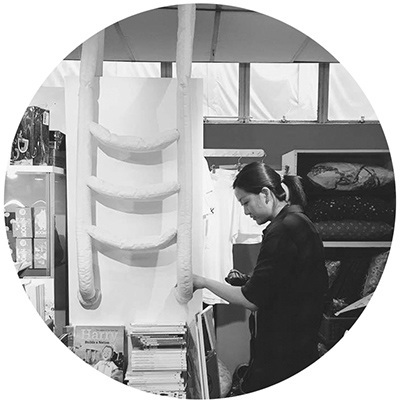 Vanessa Lim Shu Yi graduated from art school less than two years ago and has since developed an active profile in the local scene. In 2017, she completed a residency at Grey Projects, and participated in the Holland Village edition of OH! Open House. This year, the artist will continue investigating the way we interact with urban space and structures through the Concerned Citizen’s Programme, organized by The Substation. "water / 1" marks the first time that Vanessa has tackled an entire exhibition space on her own. Arranging small works into new configurations and directions, this presentation creates a draft of an entirely imagined site, situated within the passageway. Your ideas always seem to stem from the spatial and emotional constructs surrounding water. On its own, water is a cleansing and strengthening force, and yet it can also be a mysterious, destructive element. What is your interest in this changeable substance, and how does it inform your practice? My initial interest in water came from spending time in swimming pools, and examining the relationship we have to water in interior forms (water from the sink, shower, pools, tubs, etc) where our interaction with water is highly mediated either through structure/ architecture or material (chemicals). Water, being liquid itself is formless and very much defined by what contains it, and we are always trying to contain it. Naturally I began looking at water on a larger scale: oceans, rivers, lakes and the structures that negotiate the interaction of water with our coastlines. The relationship between water and a seawall and water and a breakwater are vastly different in quality for example. What happens when the structures that mediate our relationship to water fail us? How did we regulate our interaction with water before these structures were put in place? I’m interested in these tensions and how they can operate as metaphors for larger spatial and conceptual concerns. Let’s talk about some of the titles behind your individual pieces in water / 1. How do they inform the presentation as a whole? Water has always been a potent site for fiction and the imagination. The titles make reference to 3 forms of water in fiction—film (Drowning by Numbers, Peter Greenaway), poetry (Going for Water, Robert Frost) and prose (20,000 Leagues Under the Sea, Jules Verne). I hope the titles help provide an entry point into the work, which I have tried to position as fictional sites. Detail from Drowning by Numbers (2017). Acrylic on canvas board, acrylic scale figure, architectural scale tiles, polyurethane foam, plaster with marble powder, plaster with paper pulp, fishing bait and hooks, plywood. 170 x 80 cm. water / 1, I_S_L_A_N_D_S. water / 1 addresses some of the boundaries, transitions, and gaps that occur when we look toward physical conditions of our built environment, how this defines our movement, and how we define our personal autonomy through this. What are some of the public spaces and urban designs that inform your inquiry, and how have you considered the site for this presentation? Currently I’m looking at spaces that mediate water like jetties, bath houses, and various types of swimming pools like cantilever ones and indoor diving pools. I’ve begun looking more at structures that have the quality of a proxy / substitute / prop, and am interested in structures which our bodies can perform, such as fitness machines. The work responds to the display format of the space. This shows through in terms of the idea of a “model”. There was also a really interesting abandoned wooden structure left in the tailor shop in front of the space, which acted as a catalyst that prompted the rest of the work. Sadly, it was removed before the actual show. You’ve previously explored the relationships and dichotomies between materials and their purpose. For instance, you recreated commonly used swimming floats with very heavy materials that would sink, or transposed tactile profiles of specific places onto unexpected surfaces. In this presentation, these elements are merged with a deliberate flattening of planes and dimensions, as well as juxtapositions of scale which opens up to even more interpretations. How do you see this developing further? I’m hoping to further develop the ideas grounded in fictional spaces and turn them into actual physical installations. I’ve latched on to the idea of the ‘prop’ or the ‘set’ and have tried pushing this further in a new installation work for RAID. Group show by artist organizers Daniel Chong and Zuklhairi Zulkiflee, featuring Ivan Ng, Tay Ining, Vanessa Lim, Jacqueline Sim, Pooja Kanade, and Nhawfal Juma’at. Tiong Bahru Air Raid Shelter, Singapore, 13 January–3 February, 2018. Here you’ve also incorporated a series of small, mixed media paintings that almost function like microcosms of unknown dreamscapes. The random placement of scale figures even suggests out-of-body experiences. What is the strangest place you have ever stumbled upon IRL? The strangest place I’ve been to is the Sedlec Ossuary (bone cathedral) in the Czech Republic. I also found the Centre Pompidou to be quite a strange place. If you were stranded on a desert island, name three things you would bring and why. A very large cactus - for water. Matches - for fire. Blanket - for sleeping. Can you draw this island for us?